SpeedyPin.com is a major calling card reseller. They sell a variety of cards issued by large calling card wholesale carriers. They are among the 5 biggest calling card companies according to recent Alexa rankings. SpeedyPin offers about 50 different calling cards to meet a range of customer needs. Most of their cards are designed for outbound international calling from the US and Canada to other countries. They do have some cards for calls originating from other countres, but this is perhaps not their strongest suit. 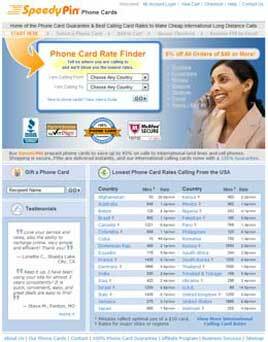 SpeedyPin resells calling cards for several leading calling card wholesalers, including Telecents, ETI, and SPP. Their carriers are generally solid companies, but we aren't a fan of one of their carriers, STi Prepaid, which has been involved with several legal actions recently, so we recommend you avoid their cards. In terms of rates, SpeedyPin pricing is very comptetive - in some cases offering the lowest prices for some routes we've looked at. However, like any company, rates are not uniformly the lowest for all calling routes, so you need to check the specific destination(s) you plan to call. Also note that card pricing changes frequently. In terms of pricing disclosure, SpeedyPin publishes a very clear table listing all applicable charges for their cards - except one: a transaction charge of $1 on all orders under $20. The fee used to be $2 on orders under $40, but has been revised. As far as we can tell, this fee is not listed anywhere on the site (very bad oversight), but phone agents will disclose if you ask them about it. This something that should be disclosed more prominently. Also, please be aware that many Speedypin cards are relatively 'dirty' - meaning they include carrier service fees and/or other fees. This can have a dramatic effect on the per minute rates you actually pay in real life usage. As general rule, we don't like these types of fees, but they are common in the industry and SpeedyPin fully discloses them. Bottom line: SpeedyPin.com is solid company with a strong satisfaction guarantee. We rate them a 'qualified buy' - meaning you can get extremely good deals if you shop carefully. Description SpeedyPin is a leading calling card reseller and is ranked among the top 5 biggest calling card companies according to recent Alexa.com calling card rankings. The company carries several dozen calling cards with varying rate and fee structures. It is largely US and Canada focused, but sells a number of cards for use in other countries. Countries where cards can be bought Speedypin cards can be billed to addresses in any country. Countries with access numbers Most Speedypin cards have access numbers only in the US and Canada. However, a handful of their cards, e.g., the Globetrotter, have access numbers in most countries worldwide. Competitive rates Many SpeedyPin cards have great rates - others, not so much. It is a mixed bag, but if you shop carefully, you can get an excellent card. Stick with the clean cards and avoid cards with extra fees (like STi Pollo Loco card). 'Clean' pricing Many SpeedyPin cards have carrier service fees of about 20% that get added on top of per minute rates. Nothing really wrong with this - it is a common practice - but it does mean you need to do a little math to add the ~20% surcharge to the advertised rate to get your true per minute rate. Full disclosure SpeedyPin does an overall great job with rate and fee disclosures. The way they present their rates and fees is perhaps the clearest of any company we've reviewed. But we're tempted to give them a 'yellow' because they don't disclose a $1 transaction fee on orders under $20. They tell us that many repeat customers are able to avoid this charge by using a discount coupon and/or buying higher value cards. Whatever the case, the fee should be better disclosed. Card selection For callers from the US and Canada, SpeedyPin has a good selection of 45-50 calling cards from several different carriers. For callers in other countries, the selection is quite limited and rates are higher than from other vendors. Carriers Clearly states the carrier for each card and carriers generally are solid - and include some Tier 1 carriers like Verizon and AT&T. But cards from one carrier, STi Prepaid, are probably better to avoid. STi Prepaid has had some problems of late. Website usability Website is very clean and well organized. Easy to use. Privacy and security Top notch security and privacy protections, including 128-bit SSL encrupption for credit card purchases thru VeriSign plus certification from McAfee and SiteSafe for safe, virus-free website. Customer support They've been available and responsive when we've called. Access numbers Access numbers we've used have worked fine. Advanced features Some of their cards have PINless dialing. None have speed dialing as far as we can tell. We aren't aware of any mobile apps or other calling options that are becoming increasingly common with other top providers. Reputation Speedpin seems to have a good reputation. We have received no complaints about them on this website. They have also recently been upgraded to an A+ rating by the Better Business Bureau. Return policies SpeedyPin has a strong calling card guarantee. The guarantee works where you are first directed to seek resolution with your card's carrier. If that doesn't work, then SpeedyPin will 'intervene on your behalf' and will make up for any shortfall. This is good stuff, but remember this is the calling card industry, so keep your expectations in line. SpeedyPin.com is a popular calling card company that sells some excellent low-cost cards. If you shop carefully, you can get a excellent deal. However, we suggest you avoid cards from STi Prepaid, a wholesale carrier that has been sanctioned numerous times by US government agencies. Particularly if you are calling from the US or Canada, we recommend you consider SpeedyPin.com for your next calling card purchase.